Apple isn’t in the business of antagonising police, so this update arrives without making a big deal out of the feature. We wouldn’t recommend downloading a major overhaul of an operating system without spending some time with it first, but this is a minor update. 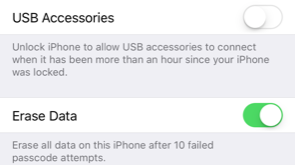 USB Restricted Mode isn’t even listed in the brief summary of changes on the download screen, and iOS 11.4.1 mostly serves to fix a few tiny bugs. What’s more, it’s enabled by default once you’ve installed the update. This should not lure you into a false sense of security. There have already been reports that Grayshift found a way to circumvent Apple’s latest attempt to lock unauthorised individuals out of your private data. That’s just the way information security works – the job is never done. Doing crimes is dumb. Doing crimes on devices that are connected to the internet is dumber.